Lithuania's parliament has backed a bill that censors certain information, including on homosexuality, from reaching minors. MPs overturned a presidential veto of the child-protection law, which critics say could institutionalise homophobia. The legislation would ban the public dissemination of information considered harmful to minors. This covers material on homosexuality, bisexuality and polygamy, as well as depictions of violence and death. Eighty-seven of the 141 MPs supported the bill, while only six were against. Correspondents say homosexuality is frowned upon by many in Lithuania, where the majority of the 3.3 million population is Catholic. The authorities have in the past prevented gay rights activists from holding public gatherings, or struggled to protect them from attack. Last month, MPs approved the "law on the protection of minors against the detrimental effect of public information", but outgoing President Valdas Adamkus refused to sign it before he left office. His successor, Dalia Grybauskaite, is not able to re-impose the veto on the legislation and is required to sign it within three days, after which it will take effect. The head of the Lithuanian Gay League (LGL), Vladimir Simonko, said parliament had "demonstrated its will to institutionalise homophobia". 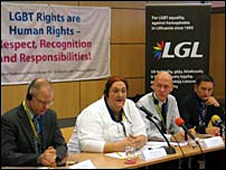 The human rights group, Amnesty International, meanwhile warned that the law could be used to prohibit any legitimate discussion of homosexuality, impede the work of human rights defenders and further the stigmatisation of and prejudice against lesbian, gay, bisexual and transgender people in Lithuania. "This law is a clear infringement of freedom of expression and non-discrimination rights and should be repealed immediately," said Amnesty International UK's LGBT Campaigner Kim Manning-Cooper. The legislation also bans material that "encourages gambling, encourages and suggests participation in the games of chance and lotteries", "promotes bad eating, sanitary and physical passivity habits", or gives credence to paranormal phenomena and hypnosis. The text does not define "public information" in detail, although it makes references to TV programmes, films, computer games and advertising as well as online and print media accessible by children. Petras Grazulis, a right-wing MP who co-sponsored the bill and is also seeking an outright ban of homosexuality in Lithuania, insisted it was a necessary measure to defend traditional family values. "We have finally taken a step which will help Lithuania raise healthy and mentally sound generations unaffected by the rotten culture that is now overwhelming them," he said.